Zytek’s Operations Director Trevor Foster has some very interesting Le Mans news this morning, and also confirms a brief item in Autosport today – that the chassis we’ve always referred to as the ‘factory car’ (the Spa and Nurburgring 1000 Kms and Laguna Seca winner last year) has been sold to Japan, where it will race in the Japan Le Mans Challenge, in the care of Nova Engineering. It’s just been completely rebuilt, and will be shaken down at Snetterton on Monday, by Sam Hignett, prior to its despatch to Japan. 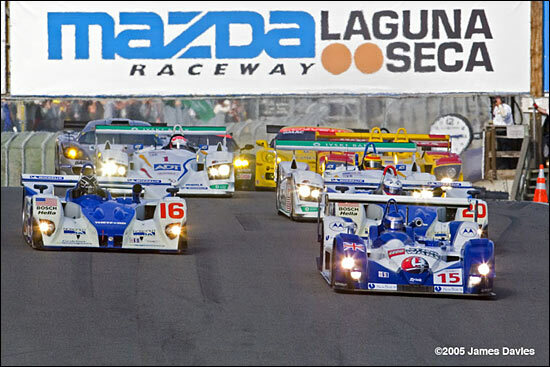 So what are Zytek’s precise Le Mans plans for this year – having just accepted a guaranteed entry for the 24 Hours? Zytek ran one car at Le Mans in 2004, and unexpectedly didn’t receive an entry in 2005. The 2006 hybrid(s) will be followed by a new (LMP1) tub for 2007, which will use the hybrid components of the 2006 cars, to make a full LMP1 design. “We’re effectively building an LMP1 in two stages,” adds Trevor Foster. No driver or sponsorship plans have been firmed up yet for the 2006 Le Mans effort – but it’s apparent that here is a company that is prepared to take up the challenge of racing against the Audi R10s, and is keen to do so with a two car entry. In other Zytek news, the Binnie Motorsports Lola B05/40 will also be shaken down at Snetterton on Monday, this car having just had its Zytek engine istalled, replacing the NME unit used in 2005. More Zytek news to come later today (here). Here's Tom Chilton leading the field in the factory 04S, four hours before the conclusion of that epic race at Laguna Seca last year.